Home» Posts tagged "PlayStation Phone"
Launching over the next two weeks across many European and Global markets is the Xperia PLAY from Sony Ericsson. 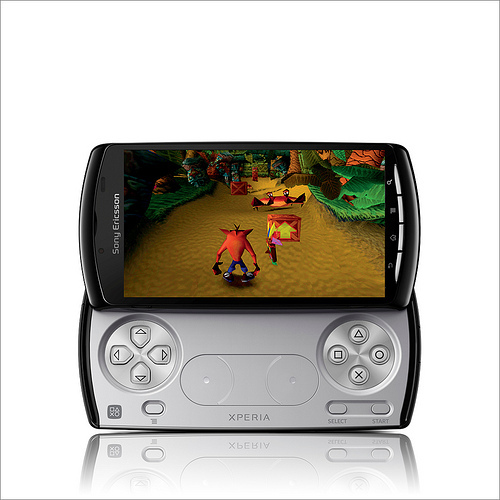 Xperia PLAY is an Android powered smartphone and the first PlayStation Certified device. It is optimised for a gaming experience and featuring dedicated gaming controls, L/R shoulder buttons and the familiar PlayStation symbol action buttons. Multiple sources have confirmed that the PlayStation Phone release is imminent, though they failed to agree on an exact release date or time frame. The so-called “Playstation Phone” will be shown at next month’s Mobile World Congress (MWC) in Barcelona, alongside a new portable game player, the report says. Talks about the rumored PlayStation Phone and Nintendo’s new 3DS console are dominating the news recently. This week, more details has come into light on the supposed ‘Xperia Play’ phone from Sony Ericsson. Chinese website IT168 states that the device will be powered by a Qualcomm Adreno 205 GPU, along with what’s likely to be a 1GHz Snapdragon QSD8255 CPU. Over the past few weeks, there has been lots of talk about the supposed PlayStation Phone, which runs on the Android (Gingerbread) operating system. There has been a number of video leaks too about the phone, but the one was have from Engadget below is the best we’ve seen so far.